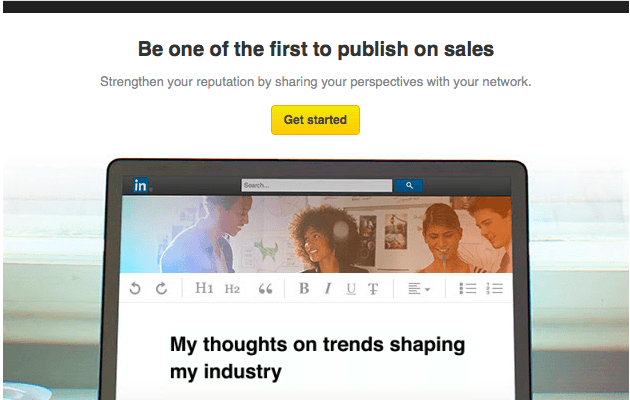 Ryan Roslansky of LinkedIn announced yesterday their publishing platform, which had previously only been available to LinkedIn “influencers”, is now available to regular users. When a LinkedIn user publishes a piece of original content it them becomes a part of that user’s professional profile and immediately shared with their network. If you enjoy content posted by other users who are not in your network, Roslansky says you will be able to follow them and receive future updates. Of course, users who aren’t in your network will be able to follow you on LinkedIn as well, which allows everyone the opportunity to build an entirely new audience. The LinkedIn Influencer program started in the fall of 2012 with its prime focus being on having industry thought leaders share their expertise. According to Roslansky, the average Influencer post drives more than 31,000 views and receives more than 250 likes and 80 comments. Top LinkedIn Influencers relevant to Digital Marketing include Mark Cuban, Guy Kawasaki, Mark Hurd &Joe Pulizzi. The invitation will vary according to what topic LinkedIn believes you are influential about. They will be expanding the capability to all members in multiple languages over the next few weeks and months. LinkedIn discourages and may disable posts that self-servingly advertise a service, business, political cause or other organization or cause that does not benefit the broader LinkedIn community. Most content on the internet belong to someone, and unless you have clear permission from the owner to share it, you shouldn’t include it in your posts. However, you can republish your own content on LinkedIn that you have personally published elsewhere, and any content you publish on LinkedIn remains your own. They certainly have all the makings of a great publishing platform, the only questions left are: will anyone actually use it, will anyone engage with the content, and how valuable will it be to your content marketing strategy in the long run? Will you be publishing content on LinkedIn now that you have the option to do so? Let me know your thoughts on this new blogging platform.